Chromatography science project - how to prepare TLC plates. MakeYour Own TLC Plates for Chromatography Science Project. TLC – is one of the chromatography methods you can try at home, as part of chromatography science project or just for fun. TLC stays for thin layer chromatography. It's similar to paper chromatography but instead of paper fine powder of some chemical used as a stationary phase. We made our plates using microscopic slides. This flat piece of glass is ideal for a small plate which will work fine for simple experiment at home. You can also compare different stationary phases and test them against different substances and different solvents which makes great chromatography science project by itself. Note: Plastic should not be used because some solvents could destroy it. For stationary phase we used starch or chalk. You could also try talc, plaster, possibly some water based paints or even silica-gel. In fact silica-gel would make awesome stationary phase (many scientists use it), but it needs special preparation which is hard to do at home. So if you're after silica gel plates you'll need to buy them. Plate base (a microscope slide or small square piece of glass). Stationary phase -- potato starch or corn starch or chalk or other suggested material. You may also need mortar and pestle. Here is how to prepare TLC plates. Put your stationary phase (in our example we used corn starch) in a bowl and add approximately the same amount of water. One tablespoon of starch requires one tablespoon of water. Mix it until you get uniform suspension. Very carefully pour small amount of suspension on the plate. Make sure you're not holding plate by the sides – that will cause suspension to spill over the edge of the plate as soon as it touches your fingers. It'll need some practice. 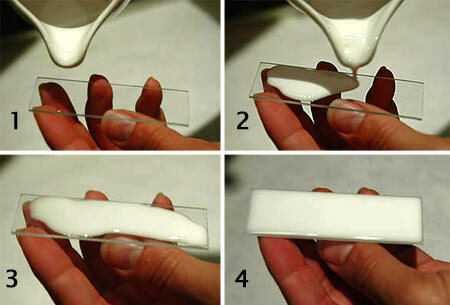 Tilt plate carefully from side to side until suspension covers all plate as a thin liquid layer. You're almost done. Put the plate in safe place on horisontal surface to dry. Drying usually takes 24 hours. After drying the surface of stationary phase may get some small cracks. It should not affect results of your chromatography science project too much. If you work with chalk, crash it in the mortar. Grind it untill you get very fine uniform powder. Grinding'll take some time. It's better to do this step well or you may get your plates filled with pieces of chalk which does not look nice and will affect your experiments. When you get fine chalk powder the procedure is generally the same as with the starch plates. Check our marker ink chromatography science project.